Life expectancy in the UK has stopped improving for the first time since 1982, when figures began. 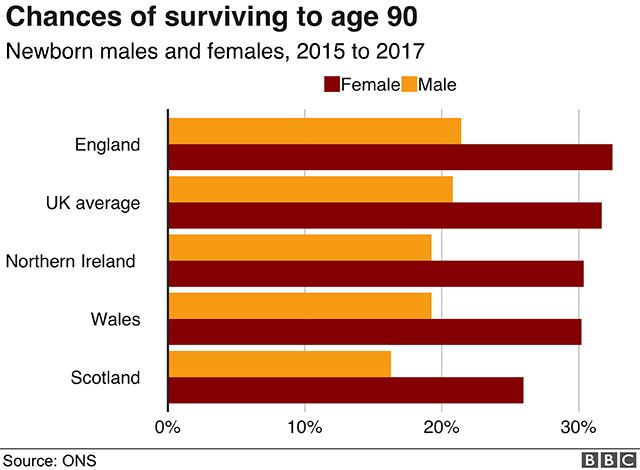 Women’s life expectancy from birth remains 82.9 years and for men it is 79.2, the figures from the Office for National Statistics, for 2015-17, show. In some parts of the UK, life expectancy has even decreased. For men and women in Scotland and Wales, it declined by more than a month. Men in Northern Ireland have seen a similar fall. 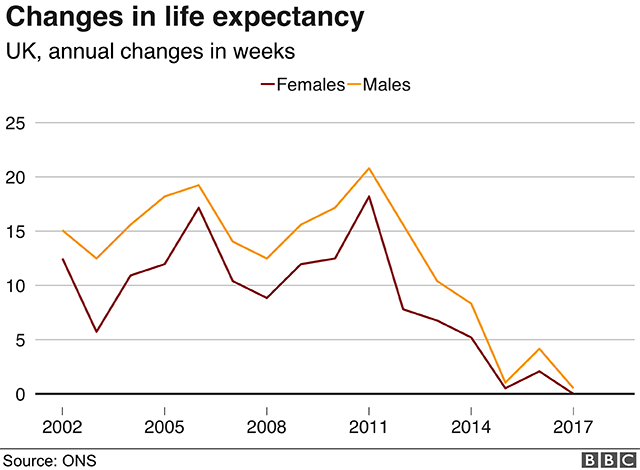 For women in Northern Ireland, and for men and women in England, life expectancy at birth is unchanged. Why did more people die last winter? The ONS said the stalling of life expectancy was linked to a particularly high number of deaths from 2015 to 2017, which coincided with a bad flu season and excess winter deaths. It said there was “much ongoing debate” about the reasons behind this and what direction the trend may take in the future. It is not clear what is driving the trend, but some academics have argued that government austerity policies, such as cuts to social care budgets in England, must have played a part. Ministers have said that no such causation can be proved, although Public Health England has been asked to carry out a review of life expectancy trends. Dr Kingsley Purdam, senior lecturer in social research methods and statistics at the University of Manchester, said the figures were “shocking”. “Poverty, austerity and cuts to public services are impacting on how long people are living in the UK,” he said. “We all need to look after our health but many of us, including the most vulnerable populations, need help at a time when evidence suggests that services are being cut. But Prof Stephen Evans, professor of pharmacoepidemiology at the London School of Hygiene & Tropical Medicine, said there were other factors that might explain the stall in progress. “We still do not know how much this is a result of direct health effects such as flu epidemics, how much is a result of social and economic factors, and how much is a failure to go on improving smoking cessation or other preventive measures,” he said. The data also shows that the UK lags behind other leading countries for life expectancy, including Switzerland, Japan, France, the Netherlands, Spain and Italy. Of the countries the ONS compared the UK with, Switzerland was the nation with the longest life expectancy for men. For women, it is Japan. Men in Switzerland are expected to live to 81.5 years. Women in Japan are predicted to live to 87. Throughout the 20th Century, the UK experienced steady improvements in life expectancy at birth, resulting in a larger and older population. This has been attributed to healthier lifestyles among the population as it ages, such as reduced smoking rates, and improvements in treating infectious illnesses and conditions such as heart disease. But in recent years, the progress has slowed. And in the latest data it has ground to a halt. The population of people who are 90 or over is still increasing but this is due to previous improvements in life expectancy going back many decades. The number of centenarians decreased slightly between 2016 and 2017, reflecting low numbers of births during World War One. But the ONS said it was expected to continue to increase again from 2019. Since the 1980s, life expectancy has been going up by roughly two months a year every year, as we saw fewer deaths due to smoking or heart problems. But after 2011, that rate of improvement has been slowing. It could be because it’s hard to keep on improving every year. It could be because of hard winters or difficult flu seasons. But we’re not sure about exactly what has caused this trend. So this data is really telling us about death rates in the UK for the past three years. And we can be sure that picture in death rates is real. How sure can we be that you’ll live as long as the ONS predicts? Not very – the ONS is not making precise predictions about what will happen in the future to determine how long you live. Medical breakthroughs, pandemics and the wars of the next 80 years are impossible to predict. A Department of Health and Social Care spokeswoman said: “Recent trends in life expectancy and mortality in the UK can also be seen in a number of countries across Europe, North America and Australia.